1972: The Soviet Union shocks Canada 7-3 in the first game of the Summit Series in Montreal. 1943: Glen Sather is born in High River, Alberta. Sather plays 10 seasons in the NHL and one in the World Hockey Association, but makes his real impact on hockey as a coach and executive, building the Edmonton Oilers into a team that wins the Stanley Cup five times in seven seasons from 1984-90. With Wayne Gretzky leading the way, the Oilers set records for goals scored that haven’t been approached. Sather is elected into the Hockey Hall of Fame in 1997. 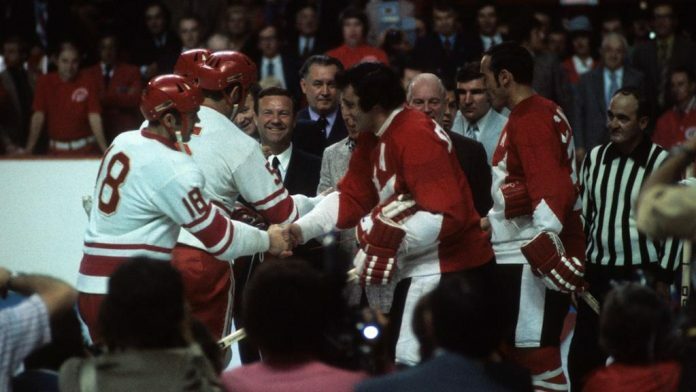 Most hockey observers in North America expect the first series between the Soviets, who are technically amateurs, and the first all-pro team to represent Canada, to end in a Canadian victory and many predict an eight-game sweep. Those predictions look to be on the mark when Phil Esposito scores 30 seconds into the game and Paul Henderson makes it 2-0 at 6:32. But the Soviets soon get over their nervousness, tie the game 2-2 before the end of the period and take a 4-2 lead when Valeri Kharlamov scores twice in the second. Bobby Clarke’s goal at 8:32 of the third period makes it 4-3 and gives the fans at the Forum some hope, but the Soviets score three goals to complete the unexpected victory. Canada defeats Finland 11-2 in Ottawa. The event allows any player to represent his country, regardless of whether he’s a pro or an amateur. It also marks a return to international competition for Canada after a six-year boycott of the IIHF. Canada’s opening night roster includes two players who aren’t part of the 1972 Summit Series against the Soviet Union. Bobby Hull, who is ruled ineligible after leaving NHL for the World Hockey Association in the summer of 1972, scores two goals against Finland. Bobby Orr, who sits out the series against the Soviets because of knee problems, has three assists.